Montreal is the perfect girl’s getaway when you miss Paris, but can’t get away for too long. It's also the perfect walking city for those of you bringing along a friend who is in the middle of a 10,000-steps-a-day challenge. Three days. That’s all you need. It’s also easier to negotiate the away time from husbands and partners, so long as you leave long lists of what to do, a yummy dish in the slow cooker or even better, if the kids are at sleep-away camp. Where we stayed: Bonaparte Hotelin Old Montreal. We loved this charming, boutique hotel on Rue St. Francios-Xavier. The rooms are spacious, the bathroom big enough for three ladies with a lot of beauty products and they serve proper French-style breakfast is included! We also loved the location. It’s centrally located, so we walked everywhere. We did not take a single taxi, just to and from the airport. DAY 1 – It’s only an hour and a half flight, so if you live in New York and the skies are thunderstorm free, you can take an 8:30 am flight and be in Old Town Montreal in time for brunch. Two of us had been to Montreal before, including a prior girl’s trip. But we couldn’t remember much. We are either getting old and the memory is going, or Montreal has changed a lot. FYI - There is a lot of construction going on! 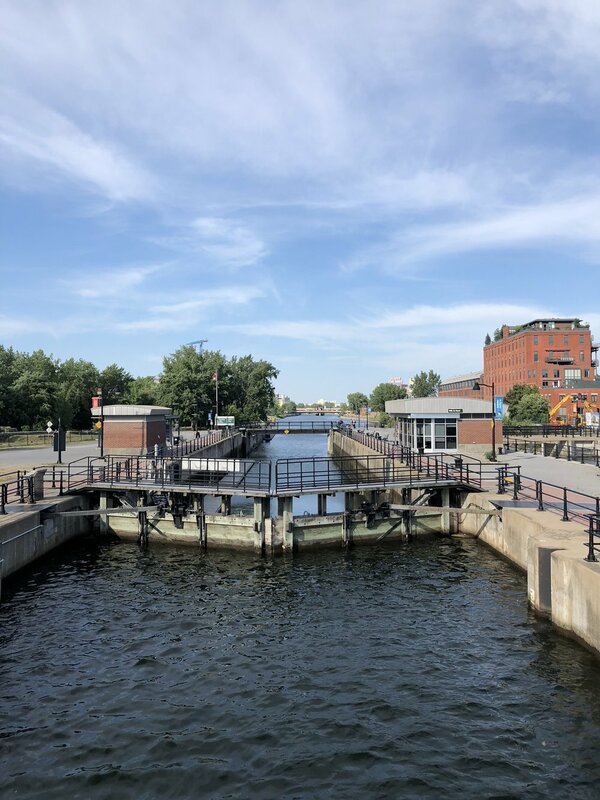 You can spend a good part of the day meandering the streets of Old Town– or you can also venture off to the waterfront to check out the Old Port, where you find a Science Center and a beach. We opted for the former, thinking we may find some cute shopping. So shopping in Montreal isn't like Paris. There were a few boutiques we thought were worth popping into including The Boho Lab(229 Notre-Dame St. W) with Moroccan -inspired furniture, rugs and accessories and a cute café, and Room Service Loft Boutique (465 Rue Saint Jean) a high-end women’s clothing store carrying an extensive collection of L.A.-based designer Anine Bing. This section of Montreal seems to have a Southern California love affair. 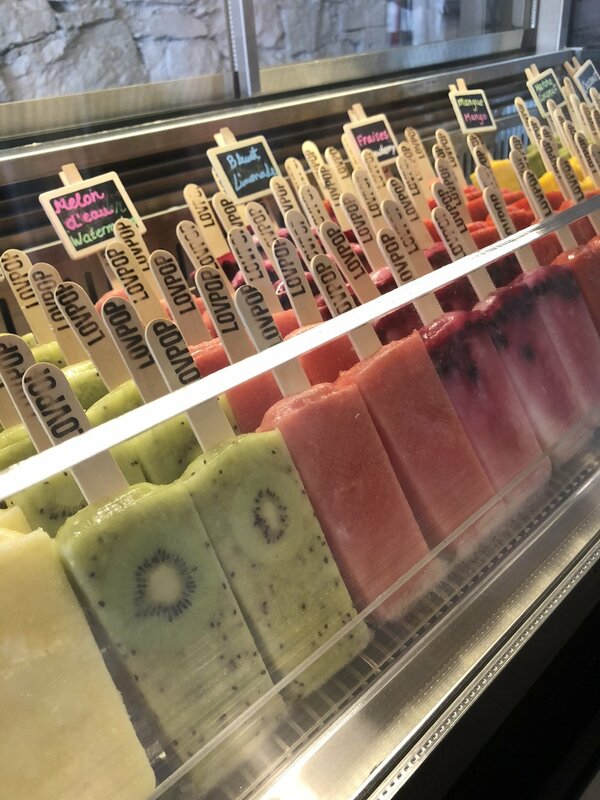 Around the corner, across the street from our hotel, there is LA Pop, a bright-colored café selling kiwi and matcha flavored popsicles and waffles! Next door is Venice MTL, a hip, loud lunch and dinner spot with surfboards on the walls. For dinner we headed to Griffintown, a trendy neighborhood about 3 kilimetres (Google maps automatically switched to the metric system!) from our hotel. It’s about a 40-minute walk from Old Town. Google maps kept insisting we walk through neighborhoods under construction. We eventually went off course and followed the river path to Griffintown, navigating our way through bicyclists and joggers. Cross the bridge on Rue Charlevoix and head to Rue Notre-Dame Ouest. You’ll see the outdoor cafes and know you have arrived. We got there before our reservation, but instead of hanging out at bar, we were searching for a shoe store because our friend had hiked in her high heels and needed relief. But again unlike Paris, we soon realize that it’s not so easy to find such shops in trendy Montreal neighborhoods. But we did find an outlet – yes, we accidentally found an outlet with discounted brand name clothes. 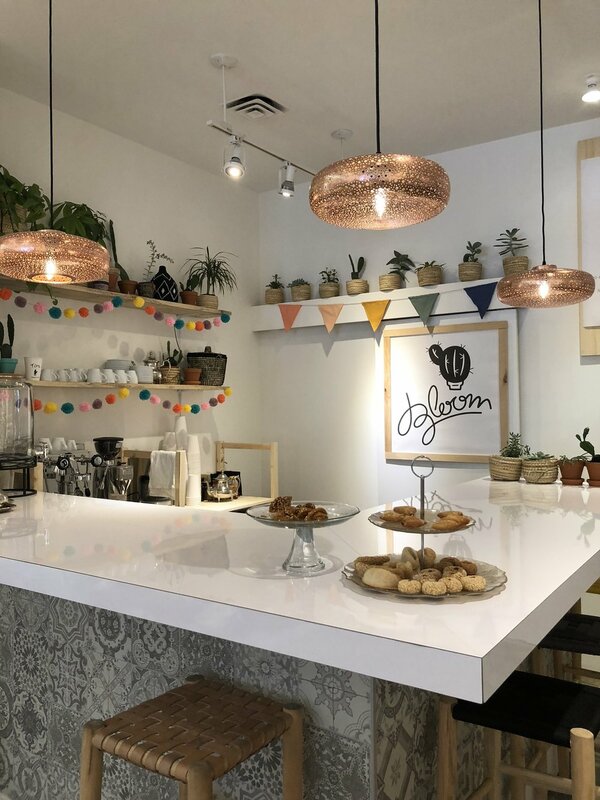 At Boutique Stockmarket (2664 Rue Notre Dame Ouest) a tiny store next to a pastry shop, you’ll find James Perse tees ,Want Les Essentials accessories and more highly discounted. But keep in mind that while the dollar is strong, the tax here is 15%. And gas prices … well, that’s another blog. Dinner was at Liverpool House, part of the Joe Beef empire. Our waitress, who was a bit surly (yes, just like Paris), didn’t damper the tasty meal. We shared appetizers and two entrees, the spaghetti with lobster and the flank steak. After dinner we walked home. Old Montreal comes to life at night in the summer and we just happened to be there during Montreal en Histoires’ Cité Memoiré, an outdoor video experience and homage to Montreal’s most famous historical characters. It was a tad creepy walking down a dark street to see a figure projected on the wall. You needed to download the app to hear what was happening. It reminded me of ghostly figures at Disney’s Haunted Mansion. But it is cool, if you are into ghosts of the past watching you. Day 2 – Off to Quebec City! Since, two of us had been to Montreal before, we decided to take a day-long tour to Quebec City via Viator. It’s about a 3-hour drive from Montreal, including one rest stop. If you do decide to take this tour, I highly recommend you grab snacks at the rest stop, because you will not be eating lunch until after 2 PM! Quebec City is beautiful. I mean heck, it’s a designated UNESCO World Heritage site. It’s like being dropped into a French fairytale with the cobblestone streets, medieval architecture and Le Chateau de Frontenac above looming like a castle. We all agreed we would like to come back here and spend a night or two. The tour gave us a tiny bite of the town and the nearby falls. Next time, we would hike up Montmorency Falls and take in its majesty from the suspension bridge. We would also meander around Old Quebec City, the only city in North America to have a preserved wall around it, taking the time to enjoy the historic sites and food offerings. By the way, this is where we tried poutine for the first time, the Québécios comfort food of French fries, cheese curd and gravy. I can see why if you grew up here, you may find yourself craving it – we all didn’t grow up here. It did pair nicely with the afternoon Aperol Spritz. We get back to our neighborhood at 9 PM. It’s Friday night in Montreal so the streets and restaurants are buzzing. We ended up at Venice MTL, located just across the street from our hotel. (Tip: The popular restaurants are packed! Make reservations before you go!) You’ll find Korean tacos with kimchee, poke bowls, kombucha and cocktails on the menu. It lives up to its name. You do feel like you are dining in So Cal … it made me wonder what the vibe is like when its 10 degrees below 0. Not that I want to experience that in person, I was just wondering. Day 3 – We do something that most moms don’t have the luxury of doing --- we sleep in. I actually got up early and meditated. I was on a 30-day meditation challenge. Yes, my friends and I love a good challenge. After breakfast, we lace up the sneakers and head off to climb Mount Royal Park or as they call it in Montreal Parc du Mont-Royal. Even with the crazy heatwave hitting the city (87 degrees), it was an invigorating walk up the hill to the top where we were treated with a panoramic view of the city. On a Saturday morning, the park was filled with tourists and residents – very much like Central Park, but with about a quarter of the people. You have to spread your own butter and cream cheese with plastic knives. My Everything bagel was tasty, a bit sweeter than a New York bagel, because they boil it in honey water. It’s also a little smaller. While good, I still prefer a good New York bagel. At the suggestion of the Lululemon salesgirl, we head to Avenue Laurier. There we found some cute art and clothing stores, along with restaurants. I later learned it’s a trendy street with it’s own website! We ended up at the back garden at one place (I can’t believe I forgot the name of this restaurant) where we feasted on a delicious dish of grilled calamari and French fries, and Aperol Spritz. We continued walking toward our hotel and venture into Chinatown, where, even though we are full from our late lunch, we try the Chinese crepes at this hole-in-the wall food stand at the recommendation of a food tour guide who my friend had eavesdropped on. I just wish I wasn’t so full to enjoy it! We head back. We logged more than 22,000 steps in the 87 degree heat! And notice, my blog stops here. We cancelled our dinner reservations and called it a night. We read that the nightlife in Montreal was fun, so we’ll just have to take their word for it. What we missed: Next time I’d probably check out the Old Port area, a museum, Underground Montreal and yes, maybe that Ferris Wheel. We also missed the fireworks competition!